Garden City Medical centre ensures that effective healthcare is delivered by specialised teams who communicate, coordinate and integrate its patients healthcare needs. The centre is dedicated to making a difference for every patient and is committed to providing excellence in patient care. To make an appointment, call us today on 3343 1344. 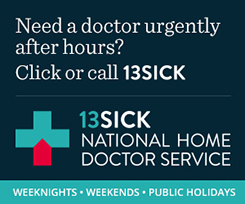 National Home Doctor Service: to book a home visit, call 13 SICK (13 74 25). SES: 132 500 For help with a damaged roof, rising floodwater, trees fallen on buildings, or storm damage. Tonic On Demand: Watch the latest health and lifestyle videos, via our 'Health TV' feature, thanks to our education partners, Tonic Health Media. Visit our 'What's New' page to stay up-to-date with the latest news and information, from in and around the practice.